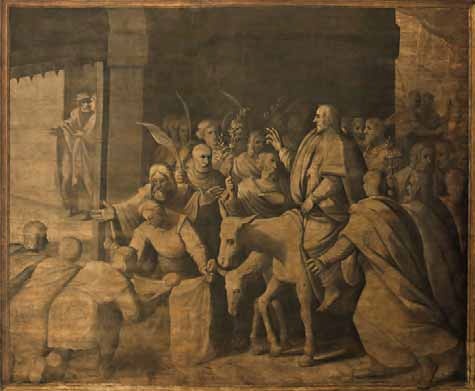 Antonio Galcerán and Jerónimo de Mora’s Painting of Jesus’ Entry into Jerusalem. When early December rolled around with the Christmas parade, it happened that our marching band hung around the Church of the Nazarene. We waited in the parking lot until time came to march the mile down the highway to the grocery store. Along the way, we repeated sixteen measures of the same Christmas carols, rolling milky ways deeper into the asphalt. If any person of Vestavia Hills had asked, “who is this?” the answer after Santa might have been, “Wonderful Counselor, Mighty God, Everlasting Father, Prince of Peace” (Isa 6:9). In the days before Passover, when the people of Jerusalem asked the crowd accompanying and welcoming Jesus into the city the same question, they answered in two ways: “Hosanna to the Son of David!” and “This is the prophet Jesus from Nazareth” (Mt 21:9, 11). Likewise, as we come to Palm Sunday, and with it Holy Week, we ask and answer similar questions: who is Jesus? The kinds of answers we are prone to give suggest what Martin Luther might describe a theology of glory. Here, it is prophet and monarch. We might describe a friend or a servant. These are good titles, but over the coming week, they find their limit in crucifixion. Luther describes another theology, one of the cross. Under the cross, he insists, whatever ethic or belief we hoped could heal the world loses its power. At the same time, however, God is revealed in this emptying. In this week that rehearses Jesus’ last in Jerusalem, the movements of the church invite us to see ourselves in the story. We begin this week with great expectation, reenacting processions of palms. Before it’s over, we will remember betrayal, violence, and death. And these are holy days too. The task for us, who walk with Jesus and the disciples, is to see how this might be. • What identities and attributes do you primarily ascribe to Jesus? • What experiences have called the ways you think about God, and Jesus, into question? • How might the cross shape our hope? Our belief? Our actions? What is distinctive about the Matthean account compared to Mark at this juncture is that in Matthew there are two animals instead of one—both a donkey and the foal of a donkey are required in Matthew. There was a tradition in early Judaism that great teachers or royal figures might requisition an animal when the need arose. Hagner, taking his cue from Mark 11:2, which tells us that Jesus rode an animal on which on one had ever sat before, points out that a foal was normally broken or introduced into service while accompanied by his or her mother (see m. B. Bat. 5:3), and all the more so if the animal was going to be used in a noisy crowd. The two animals were seen as a single inseparable unit. It is hardly plausible to argue either that a Jewish Evangelist like our author wouldn’t recognize parallel construction in Zechariah 9:9 or that he actually envisioned Jesus riding two animals at once. This act is both deliberate and deliberately symbolic, for Jesus nowhere else rides in a way that places himself above the others, and the choice of animal is important. Jesus chose not a war horse, but a donkey, which was an animal associated with royal coronations and kings on parade in the city. But the choice of animal, while it has royal associations, nonetheless is associated with gentleness and humility. This acted parable or prophetic sign act was indeed meant to say something about Jesus himself. It was a symbolic and indirect calling card, but at the same time it was a repudiation of a sort of Davidic messianism that Jesus did not come to enact. Ben Witherington III, Matthew, Smyth & Helwys Bible Commentary (Macon GA: Smyth & Helwys, 2006) 390–91. William Scruggs is a graduate of Mercer University. His favorite pastimes are adding music to his listening list, TV shows to his viewing list, and books to his reading list. When he isn’t pretending to check items off these lists, he spends time with friends and plays music. He is excited for the opportunity to continue exploring the rivers of Middle Georgia and to stay in Macon as an associate editor at Smyth & Helwys. For further resources, subscribe to the Formations Teaching Guide and Commentary. Additionally, the Smyth & Helwys Bible Commentary series is a scholarly but accessible means for enhancing your study of each lesson. To purchase the volume quoted in today’s Reference Shelf, please click Here.